Grammy-nominated singer-songwriter-guitarist Susan Tedeschi and husband Derek Trucks, of the legendary Allman Brothers Band and one of rock music’s most celebrated guitarists, combined members of previous bands to form the Florida-rooted Tedeschi Trucks Band in 2010. 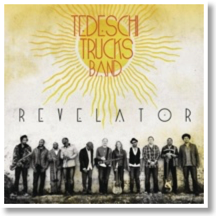 Their debut album, Revelator, contains all-original material played by a skilled eleven-member group and presents musical influences from ‘60s southern soul, Delta blues, and the career peak of the Allman Brothers Band. “Don’t Let Me Slide” fuses the influences of ABB and Bonnie Raitt and is blanketed with Trucks’ great hypnotic blues guitar, which is a recurring part of the album. Organ kicks off the mellow “Midnight In Harlem,” which harnesses a moonlight romance vibe, and the uplifting “Bound for Glory” is decorated in blues and soul music fashion. “Ball and Chain” (not the Big Mama Thornton evergreen) is colored in a breezy blues, and a sarod propels “These Walls,” an Indian classical-influenced landscape that carries a message of inspiration and endurance. Classic ‘60s blues rocker mode permeates “Learn How To Love,” a song where Tedeschi is given enough space to emote aggressive feelings. The central track, “Love Has Something Else To Say,” is a wah-wah powered blues-funk that reminds of a cross of early 1970s Isaac Hayes and mid-1960’s British Invasion blues. Tedeschi’s Raitt and Janis Joplin inflections show great capacity, and the background singers are schooled in early raw R&B and classic gospel. Revelator is a fine amalgamation of two different artists’ talents combining to create a solid statement powered by exceptional blues guitar playing and declarative vocals. Every band member here is talented, and their incorporation of different sounds in the blues idiom keeps the music fresh and vibrant. 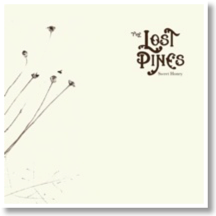 The Lost Pines have been around for only three years. Already a familiar name in the Texas bluegrass community, they’ve performed at several festivals and sold out shows. Sweet Honey is their sophomore album and offers 14 songs covering all the bases within bluegrass. Some songs are tinged with rock, while others recall country and western, but the band seems to flex well in all directions. This variety in tone is achieved by having the tracks on the album alternate between songwriters Christian Ward and Talia Bryce, who lend their vocals to their own songs as well. Produced by award-winning Lloyd Maines, Sweet Honey also features his Dobro skills on a couple of tracks. We are gifted with a strong start to the album in the form of three compelling tunes in a row. “Singing Voice” is a quick romp about the proclamation of love, treated with an active banjo line which calls the other strings to join in for some quickly plucked fun. Next follows “Maybalee,” which is softer and slower but still manages to be upbeat. The tune seems like a note to the title character from the man she loves, a hard working man with a rambling nature. Mundane details of the morning are highlighted by sweet vocal harmonies and the notion that the pair will soon have to say goodbye for some time. “Cherry Pie” nicely continues the love-note nature of the album so far. A short tune about the “best darn woman that you’ll ever find,” it solicits some serious toe-tapping. The album is packed with strong tunes, but it would be a crime not to mention the title track “Sweet Honey.” It’s quick and charming, and perhaps one of the liveliest tunes on the album, and stands in stark contrast to the next song, “Only a Flower,” a slow lament. Hauntingly beautiful, it leaves instruction for a burial and calls for remembrance not through pomp and ceremony, but rather through sharing the stories that people leave behind. Also haunting is the eleventh track, “Harm’s Lovin’ Way,” which is one of two tunes that are dusted with Maines’ skilled Dobro work. The song is closer to the Western music tradition than the other tracks and does it extremely well. Mixed in with this traditional feel is a slightly non-traditional approach, as the song is a warning to a friend about a woman who is “wanted in every state.” The Lost Pines pull it all together extremely well, and the song serves as a perfect example of what the band has managed to do. They have carried the bluegrass tradition of telling everyday stories into a present-day narrative, and done so with classic instrumentation and durable themes. The Grammy-nominated, classically-trained, Miami-based Cuban band Tiempo Libre’s festive fusion of Latin Jazz and Afro-Cuban rhythms has earned them honors as the foremost proponent of the propulsive timba. Their musical stature over the years has risen, with the group performing at respected establishments such as the Lincoln Jazz Center, New Orleans Jazz & Heritage Festival and National Public Radio to collaborations with celebrated figures Arturo Sandoval and Cachao. As teenagers in a country experiencing unrest after the demise of the Soviet Union and its support to Cuba, Tiempo Libre leader and founder Jorge Gomez and the band members found ways to alleviate their suffering, one of which was listening to forbidden American radio stations from Miami. The fertile, disparate sounds of legends such as the Afro-centric Earth, Wind & Fire, the earthy soul of Chaka Khan, and Cuba’s very own Gloria Estefan & the Miami Sound Machine ignited a hunger to seek a better lifestyle in America and to explore limitless musical possibilities. My Secret Radio chronicles this silken tapestry of music the young men experienced. “Prende La Radio” (“Turn On The Radio”) and “Mi Antenna” (“My Antenna”) divulge secret late-night tuning to American broadcast airwaves in Cuba while “Mecanica” (“More Is Less”) captures the fresh start in a new country. “San Antonio,” a city itself rife with diversity, is given a thank-you letter celebration after the band experienced much acceptance performing there. But My Secret Radio is more than just a tribute piece of American music. It pays homage to their Latin origins as well. “Aceite” (“Oil”) exalts the landmark collaboration of Chano Pozo and the grand Dizzy Gillespie, a seminal development in Latin/Brazilian jazz, and the nostalgic “Como Hace Anos” (“Just Like Years Ago”) marries the ageless Albita to a danzón groove. Even when jazz songstress Rachelle Fleming duets to a rendition of Earth, Wind & Fire’s perennial “After The Love Has Gone,” the backing is in cha-cha form and the English vocals are countered by lyrics in Spanish. 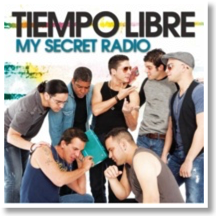 After more than 10 years, Tiempo Libre continue to effortlessly purvey and balance a heady cocktail steeped in Caribbean and American musical traditions, and they do this to not only entertain but to remind people of the free spirit of music in My Secret Radio. 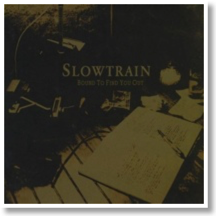 A staple of Austin, Texas, Slowtrain’s release Bound to Find You Out combines the Americana-oriented influences of Bob Dylan and the Band, the soulful vocals of Joe Cocker, and the rural and urban blues of Leadbelly and Muddy Waters. Leader Adoniram Lipton (vocals, guitar, piano) and his quartet (“the best Slowtrain has ever had,” he mentions) create a musically and lyrically solid love- and spiritually-centered debut. “Not The Only One,” a jubilant opener and standout, recalls ‘70s-era piano rock riffs and features whistling at the fadeout, reminiscent of Otis Redding’s “(Sittin’ On) The Dock of the Bay.” The title track ups the ante with stuttering harmonica and high-pressured blues-inflected vocals, an energy that segues into the love poem “About You.” Co-producer Mark Addison (Guy Forsyth, Sara Hickman) lends his organ chops to the rolling keys and Elton John-posturing of “Nobody Loves Me (Like You Do).” The influence of Bob Dylan is preponderant. “Love Me Again” is a Dylan-esque ballad, and “Waiting Just for You” is bedecked in biblical imagery, recalling Dylan’s Christian period, while the literary-steeped “Just Like Cheever” is a paean to the classic novelist John Cheever, again using Dylan’s allusive techniques. Bound To Find You Out’s accomplished musicians and skilled songwriting, recalling the ‘70s roots-oriented and singer-songwriter foundation, makes it a worthwhile set. By the 1950s, rhythm and blues revues were live concert sensations, pioneered by figureheads such as the luminaries Johnny Otis and Alan Freed and lasting labels such as Atlantic Records. Despite the name, which initially was a catchall phrase to replace the term “race music,” these revues featured jazz and blues artists such as Count Basie and Muddy Waters. But by the 1970s, these multi-artist touring groups had slowed to a crawl. 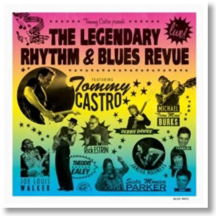 As part of Alligator Records’ 40th anniversary celebration, Tommy Castro’s The Legendary Rhythm & Blues Revue recaptures this spirit of the live touring “chitlin’” circuit of yesteryear. Despite comprising blues-oriented artists, there is a mixed bag here in terms of different blues sounds, ethnicities, and genders that reach different demographics, and the concentration of gifted talents is simply stunning. Joe Louis Walker, one of the greatest blues guitarists with an over 40-year performing career that included backing giants such as Lightnin’ Hopkins, serves an aggressive blues punch with “It’s a Shame.” On the other hand, the great harp/harmonica player and singer-songwriter Rick Estrin offers an incredible harmonica outing towards the conclusion of “My Next Ex-Wife.” Theodis Ealey’s “This Time I Know” reinforces the vitality of the soul-blues sound of Little Milton and Bobby “Blue” Bland while Michael “Iron Man” Burks’ “Voodoo Spell” is an entrancing guitar showcase of blues fire. The Legendary Rhythm & Blues Revue demonstrates the blues’ broad reach and eclecticism. Every space on the compilation is used to impart the excitement and vitality of the music. This release is definitely destined to be an enduring blues recording. 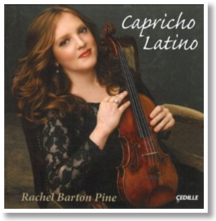 Rachel Barton Pine began playing the violin at a very young age, but when it came time for recitals and competitions her family didn’t have the money to cover accompanists. As a result, Pine had to learn to play pieces written for solo violin and quickly grew to love unaccompanied pieces. Capricho Latino marks her twelfth record with Cedille, a notable accomplishment even before considering her several projects apart from her current label. One of these efforts has Pine utilizing her love of metal to draw in new listeners to the classical music world by covering acts such as Black Sabbath and Metallica on the violin. She enjoys trying new things on her instrument, including playing relatively unexposed pieces. More than half of the tracks on Capricho Latino are world-premier recordings. The album begins with the guitar classic Asturias (Leyenda) by Isaac Albéniz which features quick, clear, pizzicato and a wide range of expression before a run of six songs based on folk tunes given Latin flavors. We are given Rapsodia Panameña by Roque Cordero, who frames traditional Panamanian music in quick strikes, Balada Española (Romance) featuring fluid arpeggios delivered by skilled fingers, and Prélude Ibérique by César Espejo, which evokes traditional Spanish music while using a classical vocabulary and quick, masterful bow strikes. Next are two tunes by Manuel Quiroga which give a nod to Galicia and his Celtic heritage by bringing in common Celtic themes and using drone notes to imitate bagpipes. Two works on the album were written for Pine. The first, Epitalamio Tanguero, was written by Luis Jorge González as a wedding present to Pine and her husband. González wrote into the piece many chances for Pine to utilize her expressive playing, each of which she fills beautifully. Her second dedicated piece is Aires de Tango by José Serebrier and is inspired by the tango.There is no shortage of tango on Capricho Latino, and a highlight comes in the form of Tango Etude No. 3 con Libertango, which Pine herself arranged. In preparing the arrangement of these two pieces by Astor Piazzolla, Pine studied the body of the composer’s works and pieced together how Piazzolla might have written Tango Etude No. 3 and Libertango if he had the violin in mind. Both Etude No. 6 by José White and Capriccio (Offrande à Sarasate) by Joaquín Rodrigo were written for the violin. Indeed this intention gives the pieces much of their strength. They require virtuosic precision from the performer and Pine absolutely delivers. On Recuerdos de la Alahambra, originally written by Francisco Tárrega for guitar, tremolos evoke Arabic music and cause the listener to imagine the quick wrist that must be needed to pull them off. The album concludes with Alan Ridout’s Ferdinand the Bull, with actor Héctor Elizondo reading the narration. In it, the listener is transported to the fields of flowers and the bull-fighting ring imagined in the piece previously brought to life by the classic Disney cartoon. It nicely brings together the album’s mix of Latin tradition and execution while incorporating composers and arrangers of Latin and non-Latin background alike.